LIVE in Tsudanuma this Obon Weekend! How often do you try new or different things? I try new things only every once in a while. A few years ago, I tried a classical music concert on a Sunday afternoon. It was my first classical concert since I was a kid. I slept through half of it but I enjoyed it very much. Now I go to a classical concert twice a year. 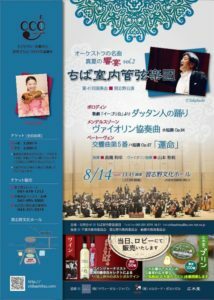 I’m looking forward to the next one by the Chiba Chamber Orchestra on the 14th of August. Pudding and wine in the lobby beforehand! Should be interesting. I do that and I’ll probably sleep through the entire concert. Miho, who’s been practicing the violin every weekend for the concert is also a student at eclipse! I hope you are making lots of interesting plans for your Obon break this year too. By the way, the school will be closed from the 11th to the 15th, if I haven’t already reminded you directly.